Northwest Vista College Digital Media faculty member Viviane Marioneaux will take on an additional role as a Quality Matters coordinator. In this role, she will be encouraging other faculty to get their online hybrid course nationally certified, and for them to become peer reviewers. Viviane’s course was the first to get certified by Quality Matters in the entire district. She will be offering workshops on how to incorporate QM into existing course design. She said it’s not about changing curriculum but rather enhancing the existing course to help students really be able to focus on learning. 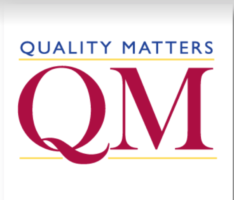 According to the Quality Matters website, it says Quality Matters began with a small group of colleagues in the MarylandOnline, Inc. (MOL) consortium who were trying to solve a common problem among institutions: how do we measure and guarantee the quality of a course? In 2003 MOL outlined how the Quality Matters program could create a scalable process for course quality assurance, and applied for a Fund for the Improvement of Postsecondary Education (FIPSE) grant from the U.S. Department of Education.